Pariaman is a small town on the western coast of West Sumatra of only 73.36 square kilometres. Since the beginning of the 20th century, the town has seen no more merchant ships for the absence of a suitable port. With its port and commerce now only a nostalgic history, the municipal administration has turned to tourism. One of the tourism highlights of Parimana city is the Tabuik festival—the core event of West Sumatra’s tourism calendar which celebrates the Muslim Asyura on the 10th of Muharam (first month in the Islamic calendar), and has been held annually since 1831. This year, it started on November 1. Though the Pariaman people do not follow the Shia school of Islam, this celebration commemorates the death of Shia hero Hasan and Hussain, descendants of the Prophet Muhammad. 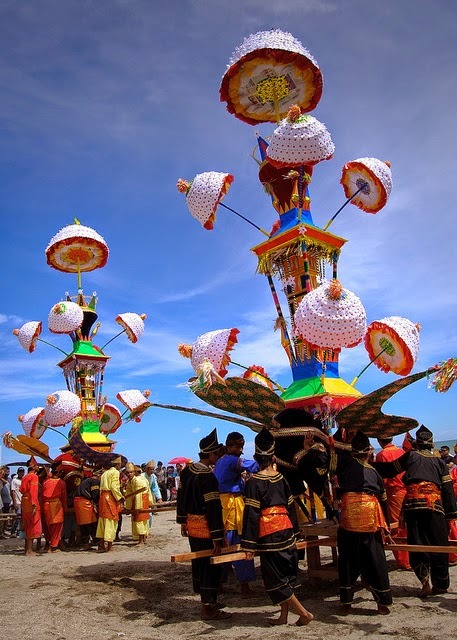 Despite its origin, a tabuik rite is not only a religious ceremony but also Pariaman’s main tourist attraction. A tabuik is a statue of a burak, or a steed with broad wings and a human head, with the heads of smiling girls, wings and broad tails. It is made from bamboo, rattan and paper. On their backs are coffins with beautiful decorations and umbrellas on top. On both sides, the statues are decorated with eight paper flowers. In the days before the festival begins, scores of dol and a few tasa drums are collected from stores outside of town and brought to the two tabuik homes to be tuned and repaired if necessary. Meanwhile, the materials and tools to make daraga (funeral shrine) and the elaborate and high funeral bier burak would be brought to a shed outside the tabuik homes. For each of the ten days of the festival, a set of ritual requirements must be satisfied. Any variance from the rules could result in disaster. On the first day, men construct the first stage of daraga on a clay mould in a nearby yard and build a bamboo fence around it. Groups of women in each tabuik house begin to decorate umbrellas with scores of white paper flowers to be placed on the daraga and to decorate the high burak itself on the tenth day. On the afternoon of the first day, two villages in charge of organizing the tabuik festival hold their first main procession: maambiak tanah (take a cloud of earth), which symbolizes the bodies of Hasan dan Husain, from dust to dust. The second to fourth days are intended to be silent days, serving as ‘the calm before the storm’, while shifts of craftsmen work around the clock to finish building and decorating the two burak. The major rituals are to be held on the fifth day. Turun panja (the outspread hand comes down) ritual will take place. Panja, also known as jari-jari (fingers), is made of gold, silver or zinc, symbolizing the dismembered hand of Hasan. It is brought down for this ritual every fifth of Muharram and given its annual purification wash in lemon water. Late that afternoon, the ceremony called mamancang batang pisang (cut the banana stalk) will be carried simultaneously in both villages. The intensely emotional experiences of the fifth day will be followed by light entertainment on the next. In the afternoon of the sixth day, the tabuik lenong (small model tabuik) procession takes place around town. A decorated tower about one and half metres high will be carried above the head of a participant on each side and will be swayed from side to side like the swaying of the great tabuik on the tenth day. At noon of the seventh day, maarak jari-jari (procession of hands) takes place and the passionate atmosphere returns. In doleful processions around the street, each side parades its panja and chants phrases such as “Hasan, Husain, Kasihan Hasan, Kasihan Husain” (Hasan, Husain, Poor Hasan, Poor Husain). By the evening, the feeling of tragic excitement reaches fever pitch, and the beruji and mandara mock war scenes begin, symbolizing perang jihad (holy war) of Karbala. On the eighth night, maarak saroban (turban procession) is held to celebrate Husain’s heroism, with models of Husain’s turban and severed hand carried by members of each side to commemorate the beheading of Husain by Yazid’s soldiers, who are said to have cried out, “We have won. Here’s the head (the turban) of Husain!” The tabuik families stay up all night on the ninth night to finish making the tabuik cenotaphs. On the morning of the tenth day, around sixteen men on each side mount the high tabuik cenotaphs on their shoulders and parade them around the streets. The constructions will be shaken—dihoyak—in elegant motion to symbolize the battle of Karbala. The accompanying crowds are supposed to scream out expressions like mahoyak Husain (Long Live Husain) and other antagonistic cries against the other side. The two tabuik go on parade and arrive at opposite ends of the main street and begin to move on their final journey to the sea. The two giant tabuik move silently across the beach, where an exciting perang pasir (beach battle) takes place. At Maghrib (prayers just after sunset), the tabuik will be thrown into the waves, symbolizing the ascent of Hasan and Husain to heaven. Daily flights from Jakarta to Padang are available with Garuda Indonesia, Sriwijaya Air and Lion. Pariaman City can also be reached by taxi or intercity bus from Minangkabau International Airport. 0 Response to "Tabuik: the Waterfront Cultural Festival of Pariaman"